New media technologies make truly innovative design possible. It is not enough to simply learn. We believe that innovative design and pedagogy can open up higher level educational outcomes to a far wider range of students than was previously thought possible. Our biology module covers the Nutrition and Digestion module of the GCSE Biology curriculum (UK). The module is designed to be an immersive and effective learning experience that motivates students and sustains their interest though contextual learning. The core of the module is a web of interactive media objects. These objects form an extensive database such as short documentary style visualisations and simulations, including elements of an animated soap opera, called 'Organisms'. The student's conceptual development is carefully designed into the structure of the module at every level. The design attempts to frame the core module principles in a broader conceptual framework that includes their personal experiences and the world around them. After a simple introductory discussion of why we eat that connects broad themes of energy, growth and basic dietary issues, students progress through an interactive learning spiral of the gross anatomy of the digestive system to the physical and chemical aspects of the digestion process. 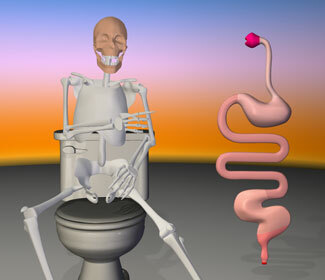 The module culminates in a 3D graphics centred exploration of the core biochemistry of digestion - the study of enzymes. In an extension of the interleaved learning structure, the enzymes section also serves as a very effective introduction to the core concepts of protein chemistry. All learning objectives are accessible through text, 2D and 3D streams. The visualisations and simulations are in the form of short documentary style segments. Interactive links integrate the 3D graphics window with the browser environment, creating a seamless web of carefully designed learning paths. Whatever the preferred learning style of the students, they will find a combination of media forms to optimise their learning experience. Even the the animated soap opera has multiple uses. It provides both amusing contextualisation for core curriculum material and a broader set of conceptual hooks for teachers to use in classroom discussion and exploration of biological processes. This makes it an ideal media form to motivate students while providing a very effective medium for the delivery of information and the expression of ideas. Organisms is an original design. The surreal humour of the characters in our animated soap opera add context and meaning to learning materials while providing tutors with emotive hooks for classroom communication. Explore even complex organic and mechanical systems in three dimensional space while being interactively linked to multiple layers of information. From the organisation and structure of organ sub-systems, to their tissues and cell, students can interactively explore gross anatomy to histology, supported by process simulation and mini documentaries. Our graphic simulations offer insight into complex processes and integrate into browser environment, permitting the construction of complex learning paths. The interactively structured multiple media streams form an intutive learning style adaptive framework. Innovative design structure achieves total immersion approach. Interleaved learning and contextualisation connect with student's personal experiences and interests while providing linkages to wider curriculum learning objectives. Real time 3D animation and graphics, high quality 2D graphics, video, sound and original narratives are integrated into a rich media database from which powerful intuitive webs of learning paths can be structured. A 3D interface and navigation form an integral part of the structural design to support conceptual development and higher thinking skills. Connect the the gross anatomy of the digestive system with the muscular action of mechanical digestion. See how these organs and their tissue structure relate to enzyme action in the chemical digestion of ingested food groups into the nutrients we need for life. Understand the digestive processesresponsible for the bodily functions and malfunctions of which we are all so aware, (and occassionally embarrassed by). We're always interested in feedback from our users. Got an opinion about the site and it's contents? Want to know more? Found errors on the site? (it is a beta) Let us know..